Possum Removal and Possum Control Services! Possum Removal and Possum Control is a common service provided by the Wildlife Experts at Hayman Wildlife Management throughout Southwestern Michigan including the surrounding areas of Stevensville, Benton Harbor, and St. Joseph. These nuisances will live in attics, under porches, under houses, and in many other structures. Possum removal should only be attempted by a specially trained wildlife removal company and should be removed as soon as it is discovered. Possums can be seen year round and will usually try to bite if they feel threatened. 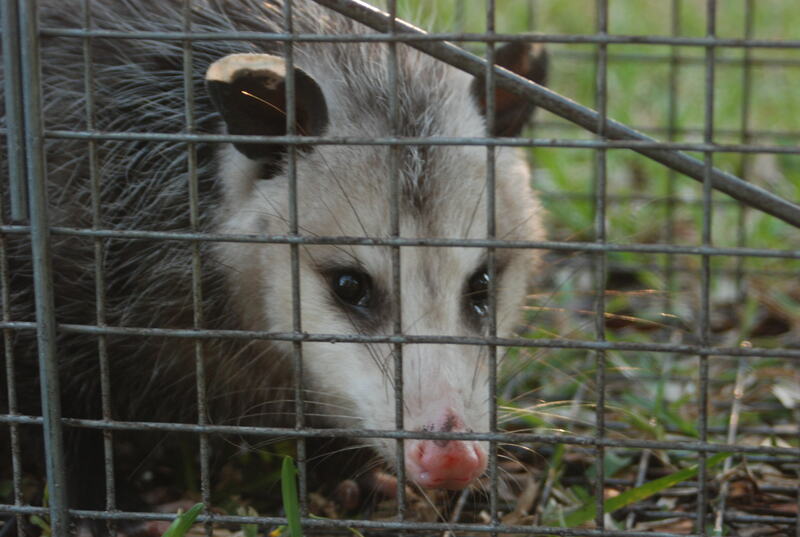 Hayman Wildlife Management is fully equipped and specially trained to handle Possum Removal and Possum Control, as will as any other wildlife problems you may be having. Possums are usually easy to catch and remove since they are not very smart and scavenge for food. This combination leaves them vulnerable to being caught. The best way to catch a possum is to physically trap them. Possums are opportunistic scavengers, which can lead to run-ins with humans. This is also due to them often living in human structures such as under sheds or decks and they commonly live inside of attics. Possums can destroy the R-value of your insulation by using the insulation as their personal toilet. This can lead to costly repairs needing to be done to your home. Parasitic dermatitis- an allergic reaction caused by sensitivity to flea saliva that leads to itchy, inflamed skin. This irritation can lead to hair loss and infection. Lyme disease- caused by bacteria that is transmitted by the bite of a tick and is the most common disease transmitted by a tick. Symptoms of Lyme disease include fever, abnormal balance, and tiredness. Bartonella- transmitted through flea and tick bites. Mostly infects only dogs, cats, and rodents but can also infect humans. Invades red blood cells and uses the cells membrane as protection while the disease multiplies. Erlichiosis- Transmitted through tick bites. Infects and destroys the white blood cells in the body of the host. Infection leads to tiredness, anemia, weight loss, and enlarged lymph nodes and spleen. Rickettsiae- Transmitted by flea or tick bites. Depending on the strain that has infected the host, symptoms can very. Common symptoms are fever and tiredness. Meningoencephalitis- Transmitted by ticks and infects the brain, spinal cord, and their surrounding membranes. Infects leads to a loss of nervous system function with symptoms including fever, pain, convulsions, and paralysis that has a rapid onset that can be fatal. Tapeworms- Transmitted by fleas on dogs and cats that ingests them during grooming. Exists in the digestive tract and shed reproductive segments of their body that are passed in the feces of the host. If you have seen a possum on your property, it is always highly recommended that you let a professional wildlife removal company handle the situation. Hayman Wildlife Management is fully licensed, specially trained, and equipped to handle all of your wildlife problems. Call 269-588-0176 to schedule your inspection today.